For two days, they burned cars. They shouted about racism and attacked police, hurling stones and shattering windows of the local police department. In Trappes, France, the riots that broke out last month over laws against wearing a niqab (or veil) in public threatened lives, disrupted the country, and raised, yet again, questions about conflicts between the culture of France's secular democracy and much of its Muslim population. And though such riots take place frequently in France (in 2005, they ended only after the government was forced to impose a state of emergency), those conflicts – and the issues they represent – seem no closer to resolution. This time, the trouble broke out after police, conducting a routine identity check, stopped a woman wearing niqab in Trappes, near Versailles, on July 18. When they asked her to remove the face-covering, her husband – a French-born convert to Islam – allegedly attempted to strangle one of the officers. He was immediately arrested, but the riots broke out soon after. By July 20, nearly 1,000 of Trappes' 30,000 inhabitants had joined the violent clashes, which spread to nearby neighborhoods. The events have reignited concern over a number of issues regarding the clashes between Muslim and non-Muslim communities that continue to plague France, which has the largest population of Muslims in Europe (numbering about 5 million). These same issues, in fact, have come to haunt all of Europe as its Muslim population grows, and, with it, the radicalization of European Muslim youth. France banned the burqa and the niqab, both of which hide women's faces, in 2010, imposing a fine on women who continue to wear the garments in public. (The law became active one year later.) Belgium and the Netherlands have since followed suit, and the idea is repeatedly broached in other European countries. Supporters of the policy claim that the burqa and niqab oppress women and violate Western mores; and that the inability to see a person's face presents a security risk to the public. Opponents maintain that the garments represent a religious mandate, and that such bans constitute religious discrimination and infringe on the rights of Muslim women – though in truth, there is nothing in the Koran that mandates any such form of dress. Yet others argue more simply that the subject of wardrobe choice is not and should not land in the realm of the law. 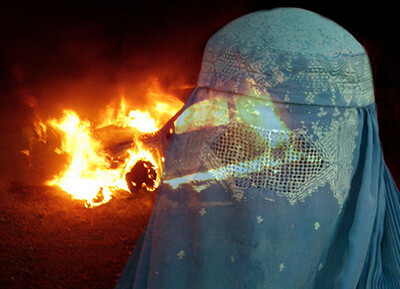 In an ideal world, perhaps this last argument would be the case; but in fact, niqab-clad women – and men – have used the garment as a tool in committing crimes from robbery (including a string of five bank robberies in Pennsylvania) to kidnapping and worse, relying on the ease with which they can move about entirely anonymously within. Moreover, with so-called "burqa bans" in place in a number of Muslim countries including Turkey and Tunisia, the law hardly, as many Western Muslims argue, represents a form of institutionalized "Islamophobia." Indeed, barely more than 400 French Muslim women have been cited for violating the ban, indicating that several million of their French sisters have been unaffected in the practice of their religion. Interestingly, too, most of those who have persisted in wearing the niqab are under age 30, according to Le Journal du Dimanche. That fact meshes with signs that many of Europe's young Muslims are becoming more religiously conservative, often in rebellion against the Western traditions of the countries in which they live – and in most cases, were born and raised. What's more, Abdallah Zekri, president of L'observatoire de l'Islamophobie, a French Muslim rights organization, says that the majority of these women are converts. They "understand nothing about Islam or the Koran, who want to be more Muslim than Muslims." In France, as elsewhere, it is both young, Western-born Muslims and Muslim converts who are the easier and more frequent targets for Al Qaeda recruiters, and for radical imams seeking to build Shariah-ruled communities in the West. The niqab fight is, in effect, simply a manifestation of this. And that, argues the French state and other proponents of the ban, is quite the point: the niqab has nothing to do with religion, and everything to do with the politics of culture, in this case, that reflect a very real threat to the Enlightenment values of the West. As one American Muslim woman (who asked to remain anonymous given the sensitive nature of the subject) told me, "the niqab isn't even an Islamic code of dress." "The Prophet's wives did not dress like this," said the woman, a Pakistani-American Muslim who divides her time between the two countries, "and so I don't understand this radical interpretation. In fact, it's not even an interpretation. It's just crazy." It comes from a "hadith"---a saying from the years after the Quran---that women should cover "all but the eyes", which some take further to mean cover the eyes too. Nothing so specific is in the Quran at all. The article states that the niqab is not required by Muslim law. So, where does it come from? More information on the logic of those who promote its use would be helpful.